What is Spacehunter: Adventures in the Forbidden Zone? Spacehunter was released to theaters on the 20th of May, 1983 just days before Return of the Jedi and is a very clear attempt to cash in on the Star Wars franchise. Movies like this are nothing new from this period, but Spacehunter is interesting for a couple of reasons. For one, it was also made after the success of Mad Max just a few years prior. For another, it was also one of the last films from that era made to capitalize on the 3D boom of the late 1970s and early 1980s. For a movie of this type, Spacehunter actually had a fairly modest budget of $14.4 million, but only managed to pull in a disappointing $16.5 million in the US. Much like Krull, Spacehunter hasn’t really managed to pull in a loyal cult following and has remained mostly obscure (hence why it was bundled with Krull by Mill Creek). What is Spacehunter: Adventures in the Forbidden Zone About? Spacehunter begins when a cruise space ship is destroyed by a freak accident in space (with an accompanying line that actually made me chuckle). Only one escape pod is ejected in time, and the three young female passengers are left stranded on Terra XI, a failed colony that was devastated by a cataclysmic plague (hence, the forbidden zone). Wolff, a freelance bounty hunter, receives word that the safe rescue of the three women is “3,000 mega credits” and sets out to get the women and collect his award. When he arrives, however, the women are soon captured by the tyrannical overlord, Overdog, who plans on using them to satisfy his “basic needs.” In order to save them, Wolff will need all of his wits, and the help of a young Scav named Niki who he picks up on the way. What Happens in Spacehunter: Adventures in the Forbidden Zone? Spacehunter is by no means a deep movie. In fact, after Wolff’s arrival on the planet, the story mostly feels like an excuse to give the audience random action scenes. On its own, this wouldn’t be a bad thing. However, the problem here is that Spacehunter tries to do this without really developing the world the characters are on. It’s implied that Overdog and the Chemist (his henchman) were doctors sent during the plague, but why they turned evil and how they established so much control over the population is never explained. This problem bleeds into other parts of the film as well. Wolff and Nikki encounter multiple strange creatures on the planet but, without any context for what they are or what significance they hold, it’s hard to really stay engaged in what it going on and makes these random encounters feel more like padding than an important part of the adventure. It’s not all bad though. For what it’s worth, Spacehunter’s action sequences are competently choreographed and shot, and the actors (Peter Strauss as Wolff in particular) do a good job of performing all of the needed stunts. On top of that, the action sequences are well paced and end fast enough to not drag, but also aren’t so quick as to seem like footnotes (well, most of the time). One thing that I failed to really notice the first time watching Spacehunter, but really appreciated the second time around, is that the writing is surprisingly well done. It’s not award worthy or anything, but there were some legitimately funny lines and good deliveries from time to time. Make no mistake, there are also some pretty groan worthy zingers here and there but, for a movie like this, that’s to be expected. How are the Special Effects in Spacehunter: Adventures in the Forbidden Zone? 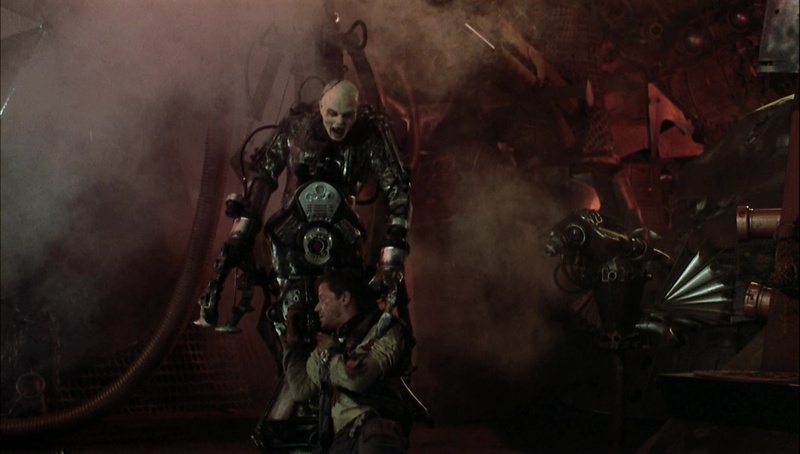 Much like the rest of the movie, Spacehunter’s effects are a bit of a mixed bag, but get enough right to be enjoyable. It’s obvious that the filmmakers were going for a trashy, post apocalyptic look in the designs and, for the most part, they succeed. The film’s vehicles, in particular, look great and it’s obvious that most of the movie’s budget was thrown at them. 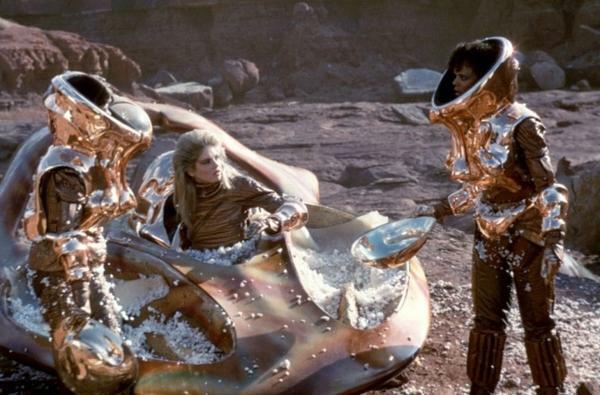 However, Spacehunter also has some props that look really cheap and half baked. Unfortunately, some of the worst ones seem to be used for those forced 3D, in your face, shots which makes them hard to overlook, and for some really awkward costumes and character designs. I acknowledge that, in a post apocalyptic setting, stuff would look cheap. However, Mad Max Road Warrior does a really good job making even cheap stuff look good and fit with the rest of the imagery around it. Spacehunter, while it does better than it seems like it should, still kind of drops the ball here. However, it’s easy to forgive Spacehunter’s effects problems when you take its climax into account. I generally try to avoid spoilers but, this movie is so light on story and context or plot anyway, that I don’t think there’s much harm. Overdog hosts a bloody game known only as the maze, a giant deathtrap that, if it can be navigated by a prisoner, will lead them to freedom. However, with so many deadly obstacles in the way, escape is highly unlikely. The effects crew really pull all of the stops here. Fire, deadly acid, death machines, it’s all here. Plus, unlike earlier parts of the movie, the designs seem consistent and appealing. It all culminates in a, though brief and somewhat confusing, well shot and good looking fight against Overdog himself. On the whole, Spacehunter’s effects aren’t the best out there, but also aren’t the worst. However, to the film’s credit, the designers at least had their priorities straight, and the film looks good where it counts (awkward 3D shots notwithstanding). How is the Soundtrack for Spacehunter: Adventures in the Forbidden Zone? Spacehunter’s soundtrack was composed by none other than Elmer Bernstein, who also composed Ghostbusters and The Magnificent Seven. In other words, the guy knows how to compose a solid score. While the music here is far from bad, it’s also no where near the quality of this other work. Still, it fits whatever is happening on screen pretty well, and can be catchy from occasion. 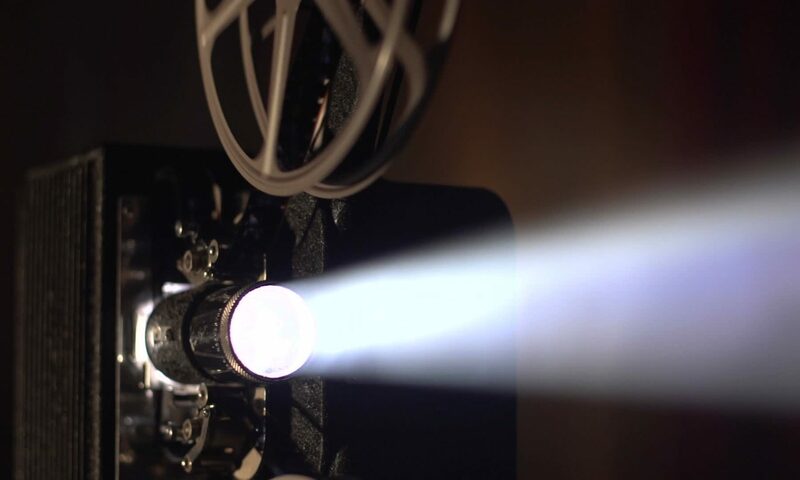 Just don’t expect a mesmerizing score from this one (but, if you were, you really need to see more movies). 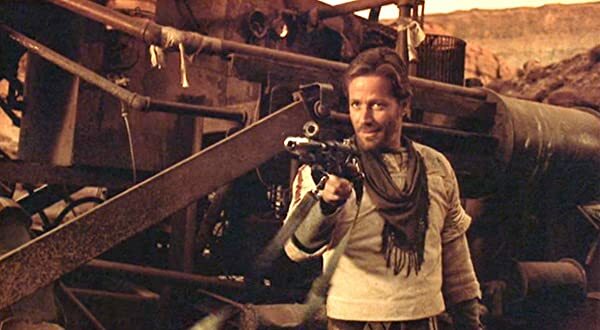 Is Spacehunter: Adventures in the Forbidden Zone a Good Movie? No. That’s a quick answer, but Spacehunter is far from a good movie. That doesn’t mean it’s not an entertaining one though. As stated above, I kind of hated this movie the first time I watched it. However, after seeing it for a second time, I can’t deny that I got some enjoyment out of it. The movie would have been much better with more background (since there is actually some potential with the world they created) a more balanced visual presentation and a less annoying performance by Molly Ringwald. Spacehunter easily fits into the category of a guilty pleasure movie. It’s a bad movie, but not a terrible one, and has just enough going for it to warrant a sit through if you enjoy this type of film. Just make sure you’re aware of what you’re getting yourself into beforehand.